THPBlog: Sierra Pacific Industries to clearcut NE of Shasta Lake on steep and unstable soils. 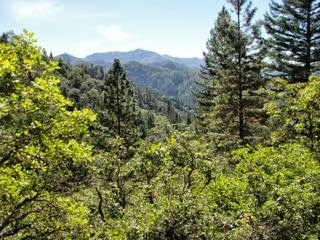 Sierra Pacific Industries to clearcut NE of Shasta Lake on steep and unstable soils. THP 2-13-062 SHA (Nosoni THP) Sierra Pacific Industries, 502 acres; 76% clearcut, 11% selection, 6% rehab, 6% roadside logging. N. Fork Squaw Creek, Nosoni Creek (MD: T35N R3W Sec.1, 3, 11; T36N R2W Sec.17, 19, 29). Winter operations, high erosion hazard, steep slopes up to 80%, steep roads, unstable area near unit 11F1, road failure site, 29 road drainage work sites, east girard roadless area, bagley fire perimeter, herbicides, oversized units, 3 spotted owls within 1.3mi, trees up to 38" dbh. Estimated public comment deadline: 10/26/13. This THP is about a dozen miles NE of Shasta Lake and I-5 at an elevation of 2,000 to 4,000 feet. The THP area drains into the North Fork of Squaw Creek and Shasta Lake, and is adjacent to the East Girard Roadless Area (sections 17, 19 & 29), and within .5 miles of the 2012 Bagley Fire perimeter (section 17). Sierra Pacific Industries is planning a mostly clearcut tractor and cable logging operation in Douglas fir, ponderosa pine, sugar pine, white fir and incense cedar forests. Unit 11F1 has a shallow unstable feature near the edge of the harvest area, and unit 1C has a fill failure related to a road which extends down slope. Units 11B, 11D, 1A, have steep slopes over 50% that lead without flattening before reaching a watercourse, and units 11B, 11E, 29F, 29D have steep slopes over 65% that will be tractor logged. Several short segments of roads are planned on steep slopes over 65% grade, and a small segment of seasonal road is planned for construction within a watercourse in section 3. There are 29 road drainage sites planned for work including rocking and culvert repair and replacement. Units 11B, 11C, 11D, 11E, 1G, 1E, and 29H are oversized. There are 3 spotted owl territories within 1.3 miles, although SPI is considering them invalid at this time. Slender false lupine was found in unit 11E, Butte County fritillary was found in sections 3 and 29, Northern clarkia was found in section 32, and blushing wild buckwheat and Shasta County arnica were found just outside of THP area. More information is available on the THP Tracking Center website.